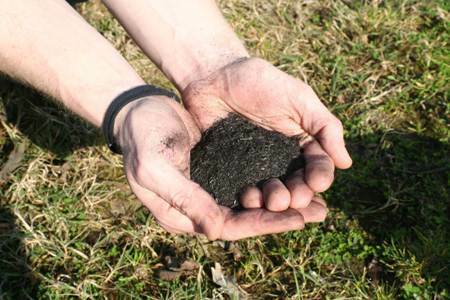 Biochar is char made from biomass, e.g. crop residues, green waste, wood chippings, chicken manure, etc. (for a comprehensive definition see this report). The concept is to sequester carbon (abating global warming) while improving soil functioning, e.g. crop production, by enhancing soil properties, e.g. water and nutrient retention. In addition, there may be benefits for waste management and energy production. The idea is to produce, transport and apply (to soils) biochar in a way that minimises overall emissions of greenhouse gasses (biochar systems) while sequestering carbon and enhancing physico-chemical properties of the soils that biochar is applied to. However, soils, and the ecotopes they are part of, are very heterogeneous systems in space and time that are managed in a large variety of ways. This means that there is no ‘one-size-fits-all’ solution, i.e. different soils will require different biochars. And the same soil that is managed in different ways, or is part of a different ecotope, will also require different biochars. In a period of rapid changes in both climate and land use, due to global change, revised agricultural policies and changing international market forces, it is vitally important to be able to assess the potential of biochar, both in terms of negative and positive potential. The functional lifetime of biochar in soils essentially moves biochar from the soil management box to the geoengineering box. While biochar may be considered as ‘soft geoengineering’ (i.e. ecosystem manipulation) in contrast to ‘hard geoengineering’ (e.g. putting mirrors in space to reflect sunlight away from the Earth), it can be considered ‘hard’ in terms of reverse-engineering. That is, it can be very difficult, or it takes a long time, to remove the biochar from the soils again if at any time that might become desirable. Qualitative literature review and Quantitative meta-analysis. In 2010, the JRC published a major biochar review as a JRC Scientific and Technical Report that has already been cited in 26 international peer-reviewed (SCI) journals and in 11 reports (governmental, NGO, and academic theses). In addition, an updated quantitative meta-analysis was published in the multidisciplinary journal 'Agriculture, Ecosystems and Environment'. This article has appeared in the top10 of the 'Top 25 Hottest Articles', for the second quarter consecutively (7th and 10th). The article is the result of work performed by a team of scientists from the European Commission Joint Research Centre, the International Institute of Applied Systems Analysis and two departments of Portugal's University of Aveiro. They collected results from worldwide experiments testing the effect of biochar on crop yields. Their quantitative meta-analysis showed a 'grand mean' yield increase of 10%, while it also highlighted a high degree of variation and the need for a strategic research effort to allow elucidation of mechanisms. The meta-analysis data matrix can be downloaded in the link below. The JRC presented about the issues facing biochar sustainability, certification and legislation at the International Biochar Initiative (IBI) conference, in Rio de Janeiro, September 12 – 15, 2010. This topic was further elaborated upon and published as a discussion paper in a special issue of the journal Pesquisa Agropecuaria Brasileira (PAB): Sustainability, certification, and regulation of biochar in 2012. To support the biochar debate in the policy-science interface, JRC staff coordinated, and presented at, an EU side-event at the COP15 UNFCCC conference in Copenhagen, December 2009. JRC staff facilitated the discussion at the convening: 'Biochar Systems for Small-Scale Farmers in Sub-Saharan Africa and South Asia'. The Bill and Melinda Gates Foundation HQ, Seattle, USA, 1st July, 2010 (solicited). "